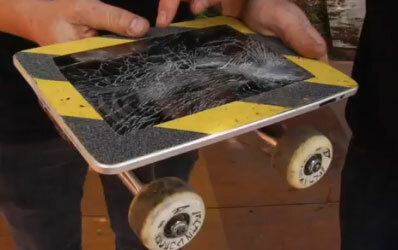 The iPad as a Skateboard! Discussion in 'Apple iPad News' started by iDan, May 6, 2010. CNET and many other online sources are all running this fun story and video today about Jeff King, the host of Fuel TV’s “Built to Shred” show, taking a 64GB iPad and turning it into a skateboard. After constructing his iPad board, King asked pro skateboarder Chad Knight to try and ride it down a half pipe and generally put it through its paces. Knight starts off by fixing wheels to the iPad, before riding it, but, surprise, surprise, it would appear that the iPad’s glass screen is not actually strong enough to resist a person standing on it (who would have thought! ), and so it cracked! After a few tweaks, however, Knight took his iPad board for another spin, and was actually able to skate around the half-pipe without having anything major go wrong, although he was sensible enough not to try any tricks. Check out the video, it’s a lot of fun! But don’t try this at home folks! Am I the only one put off by these demonstrations of what to do with an iPad (iPhone, laptop etc) other than what it was designed to do? When you know a lot of folks that would dearly love to have the technology to do something better for their life, watching someone blend, break, explode, or ride an iPad just doesn't do anything for me. I am a capitalist and I'm all for people doing what they want, but these demonstrations don't catch my attention in a positive way. He should have had one on each foot! this one is really funny! Of course the gadget cannot handle the weight of a human and besides this device is not designed for that. I found this one actually more entertaining then the others. It hurts me to my heart to see them mess up a perfectly good IPAD like that. I want to smack them!!! no kidding, especially when there are so many people dying to get their hands on one! !